I am unable to place 100% of my focus on one thing for very long. I own a yoga studio with two other partners, I teach yoga, I teach a yoga teacher training, I have a small jewelry business – I hand make jewelry – I fancy myself an amateur photographer and I write – sometimes for actual money. And lately I’ve been doing all of this simultaneously. Writing, photography and wandering have slipped to the bottom of the list. At the yoga studio we have several decks of cards from Angel and Goddess cards to Intention and Animal Messages. When I go in I typically pull an Angel and Goddess card. They are always right. For the past several weeks I have pulled one repeatedly that instructs me to go out in nature. This is good advice. That I chose to ignore. Then on Sunday as I was driving to the yoga studio, a bald eagle that looked to be 10 feet tall was standing casually in the middle of the sod farm I pass every day. I gasped. I didn’t have my camera. It wasn’t about my camera. I drove through three lights before I found a legal place for a u-turn and went back. He was still there. I parked and ran to where I could get a better look. He was still there. He turned to look directly at me – this was unnerving to me when I first began to stalk birds of prey, now it’s a gift, a recognition. We are both predators, mutual respect is called for. 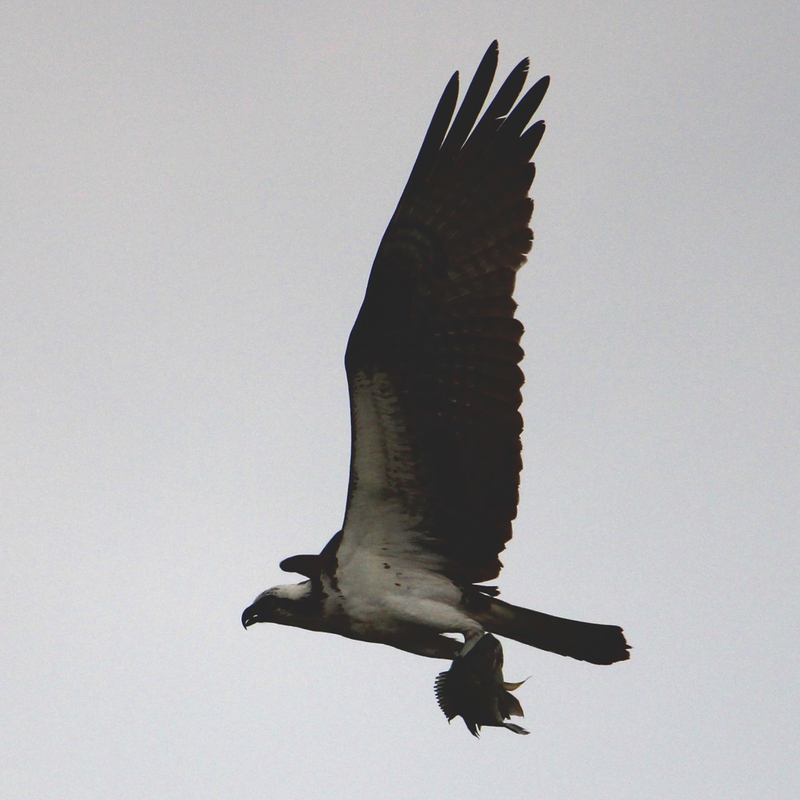 But he was more than just a bald eagle hanging out on the grass. He was a physical manifestation of the card, he was the messenger. Go out in nature. Then finally I had a morning free. Or I made the morning free. I would go to my beloved wetlands and see what I could see and just be there. The rain chance was 99%. I went anyway. As I drove past pastures of cows – each with their own bird – a yard full of goats and sheep and too many pinwheels and old barns with rusting tractor equipment I began to breathe more easily. There was more space, more green. No rain. 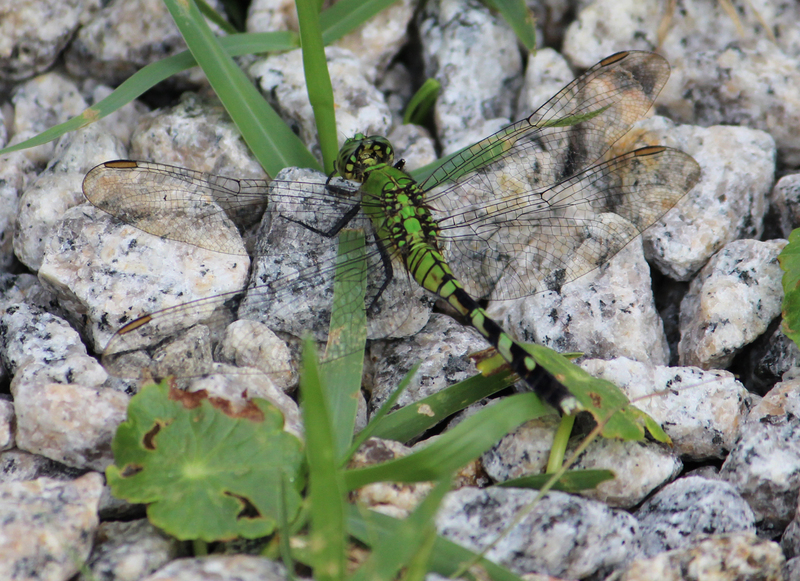 I am always greeted in the parking lot at the wetlands by a contingent of dragonflies. They cross my path and bump into me until I acknowledge them. They are my constant companions as I walk the bermed roads. Vultures usually make an appearance once I am out of my car and on the path. They are my guides and protectors. They point me in the direction I should go, warn me against potential danger and just generally watch over me. And their service is not limited to the wetlands, I often find them in my neighborhood, even in other towns and states soaring above, letting me know they’ve got my back. Today they are perched in trees variously along my route. I say hi. They wink back a greeting. I am here to see whoever wants to be seen. I learned long ago not to look for a particular something. I can be hopeful to see an owl or a bobcat or even an otter, something I haven’t come upon yet, but devoting my time to looking for it, distracts me from the wonder that is so readily available. Today I’d love to see an eagle. 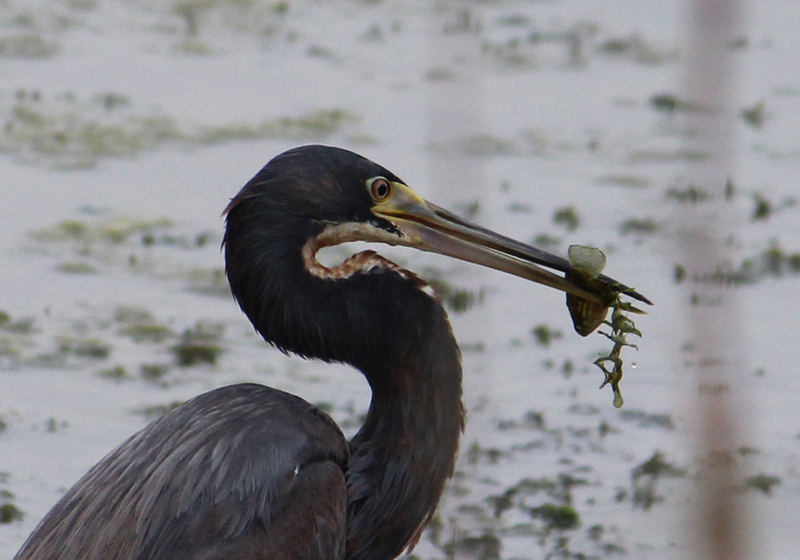 I fairly saunter alongside the swampy waters, nodding at my alligator friends, marveling at the focus and agility of a heron catching his lunch and spotting an osprey overhead with his own catch of the day skewered in his mighty talons. I am headed to a corner of the property that typically has hundreds of vultures hanging out in trees and chatting in small groups on the ground. It’s just over a two mile walk, but the threat of rain has kept the air cool and breezy so I take my time, enjoying the different calls and songs of the many birds here. Marveling at the deep, hollow croak of the gators as they call to one another across the road. 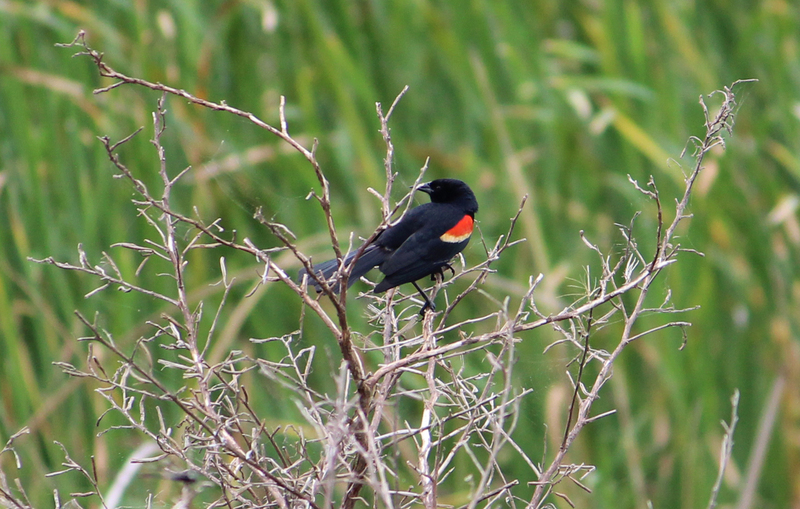 A red winged black bird is playing coy with me. He wants his photo taken, he always does, but he hides in the reeds or just on the other side of a cat and nine tail. I give up. He flies past me chirping, “this way.” I follow him with my camera, he’s still playing. Then a potential Mrs. flies by and he’s distracted, preening for her now instead of me. I tip toe a little closer, step into the grass to be quieter, when suddenly there’s movement just past my feet as a gator, startled by my bravado quickly scoots back into the water. We have an understanding, the gators and I. I thank him for honoring our agreement and apologize for startling him. I move on. At the end of this road, Wetlands Boulevard, I take a right heading to the vulture corner. It’s a mostly straight road and about a mile get there. I am a few hundred feet in when two vultures are flying in my direction from their home corner. I say hello. Then a few more are flying toward me then past. “Should I turn around?” I ask. In response about 5 more are flying in my direction. 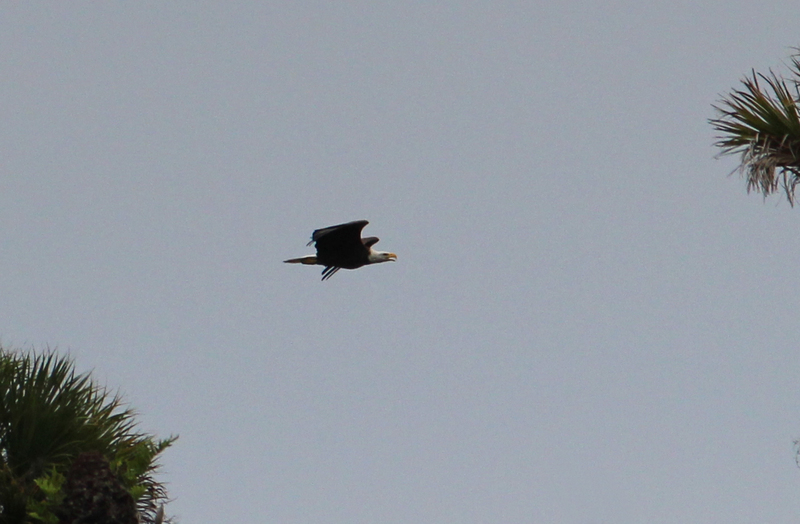 Then an eagle flies by, then more vultures. Yes, I should turn around. I walk in the direction they were flying. I have learned a few things by observing my avian friends. Vultures are considered birds of prey, but they do not kill, they clean up. Eagles kill. Vultures can often be found in natural settings, such as this, hanging around eagles to take care of anything they leave behind. The eagle is out of sight, if he’s there at all. There are 4 vultures standing in the middle of the path ahead of me. I walk toward them. Before I reach them I notice a clearing in the trees to my right. There is small bridge over a drainage ditch and this is where my friends have decided to congregate. I walk very slowly toward them. I know they will begin to hop away if I get too close. I sit down, allow them to get used to me, then scoot a little closer. They’re all facing the same direction. I look in that direction but see no eagle. I try to imagine their conversations. They are sweet, gentle, courteous, sometimes clumsy, beautiful creatures. I stand up slowly and back out so they do not need to rearrange themselves. No eagle today. My four friends are still standing on the path ahead of me. “Whatcha doing?” I glance around them. To their right, my left, about 20 feet away is a big bull gator. He’s mostly camoflauged in the high grass. I truly believe they are there to protect me. 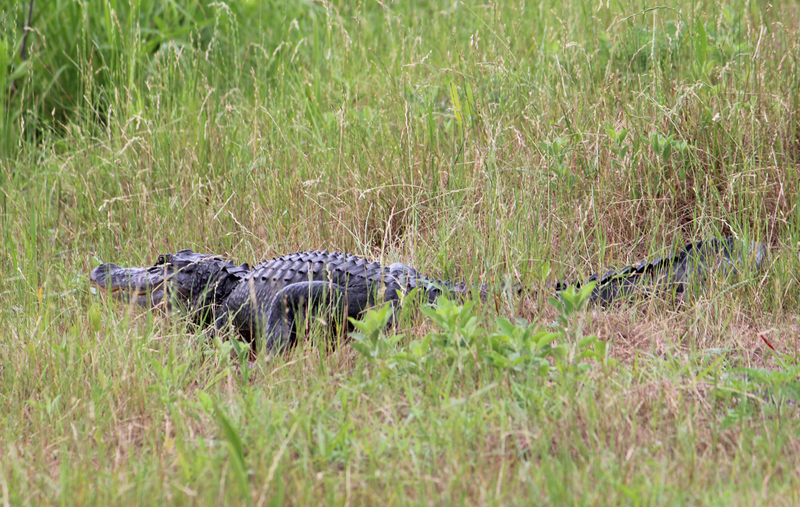 If I were to walk toward them, they would hop and fly and make a ruckus that would scare the gator back into the water. It has begun to drizzle. Had I walked down to where the vultures usually are I would have been caught in the rain over 2 miles away from my car. I am about a mile from it now. But the rain doesn’t last. I begin to make my way back. I turn to thank the vulture for their service, but they are already flying to meet their friends. Their assignment complete. As I am leaving the wetlands a tractor emerges from the woods onto the path. They are constantly working these wetlands to keep them viable. But the tractor is pretty loud and it’s kicking up a lot of dust. It disappears onto another path and it’s presence and noise disturbs many birds. One of them, an eagle. He is flying this way and that, chased by other birds protecting their nests. He really doesn’t care. I aim my camera at the blur I believe is the eagle just so I can zoom in later to see if it is. I watch him until he disappears from view, buoyed by my experience of seeing him twice. Two hours among my friends has left my spirits high and clear. Being in nature with the intention of just being in nature scrubs my soul clean. The rest of the day I am shiny despite the clouds overhead.